On June 8 the U.S. Commission on Civil Rights approved a report on the 2000 presidential election in Florida that found "widespread voter disenfranchisement." Among the report's findings was the statistic that 14.4 percent of the votes cast by African-Americans voter were rejected, compared to 1.6 percent for nonblacks. The commission report echoed state and national investigations, including a review by theWashington Post, that revealed a wide range of problems with election procedures in Florida. Problems identified included miscounted absentee ballots, unreliable voting machines, and inconsistent decisions by county election officials. As reported earlier in The Dubya Report the worst procedural error was a bungled effort by state election officials and a data processing contractor to purge felons from the state voter rolls. George Bush's go-it-alone, take-it-or-leave it foreign policy collided head-on with collective political reality at Nato's ministerial meeting in Budapest this week. Far from succumbing to the seductive advances of the Bush administration's recent strategic missile defence charm offensive, the European allies jointly gave secretary of state Colin Powell the cold shoulder. No, they did not agree that the alliance was currently facing a "common threat" from ballistic missiles in the hands of so-called rogue states such as North Korea and Iran. ...deliberation [is] essential to the political process. Political deliberation requires listening and persuading, engaging and being engaged. Success depends, above all, on compromise. That is, it requires yielding here and there to the opposition, and winning some concession here and there in return....The greatest obstacle to this kind of deliberation is hubris. The Bush so-called energy policy should really come as no surprise. It might better be called the energy business reward policy, as its major beneficiaries are likely to be the oil, mining and electrical power industries many of whose members were substantial contributors to the Bush campaign and the Republican Party. In justifying the call for increased oil production, use of coal, and a return to nuclear power the administration invoked two current but unrelated problems -- the electrical crisis in California, and the recent jump in gasoline prices. The fact that the proposed solutions have nothing to do with the current problems is the best rhetorical sleight of hand since Bush advocated the tax cut as a cure for the current economic slump. On May 10 the Senate passed the Bush budget plan by a vote of 53 to 47. 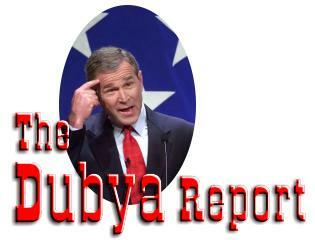 The New York Daily News, hardly a paragon of liberalism, declared "Politically President Bush won big ... Economically the country may not be so lucky. ... the nation can't afford what' been negotiated." Economist Paul Krugman writing in The New Republic stated, "The fiscal predictions that enable Bush to pay for his tax cut and contingency fund are not mere errors but deliberate efforts to deceive the public. The administration understands better than anyone that if its math were honest, the tax cut would never pass." What follows are our suggestions for the ten most egregious misrepresentations by the administration and its supporters concerning the tax cut and budget proposals. Bush Bows to "realities of the divided Senate"
Yielding to what the Associated Press called "the realities of the divided Senate," the administration gave up on the $1.6 trillion tax cut that had been the centerpiece of the Bush economic plan since he began seeking the Republican nomination, and settled for "the best deal he could get." The agreement worked out among White House officials and congressional leaders of both parties was nearly identical to what Sen. John Breaux of Lousiana and other moderates had said was the largest tax package they would support. It called for a $1.25 trillion tax cut over the next ten years, plus $100 billion this year and next. Read more about Bush Bows to "realities of the divided Senate"
After 100 days in office George Bush's approval rating for handling of environmental issues is an abysmal 41%, the Los Angeles Times reported today. As Bush wined and dined members of congress at the White House in yet another superficial gesture of "bipartisanship" demonstrators across the street chanted "Protect the people, not the polluters." Others carried signs reading, "People, not profits," and "No more poison in our drinking water." The demonstrators appeared to reflect public sentiment as evidenced by the LA Times poll. 56% of those surveyed opposed Bush's decision to overturn the Clinton administration's regulation that would have reduced arsenic levels in drinking water by 80%. 59% opposed the administration's withdrawal from the Kyoto global warming treaty. 54% also opposed Bush's reversal of a campaign promise to reduce carbon dioxide emissions from power plants. Apparently unswayed by administration rhetoric that environmental decisions would now be based on "sound science" the LA Times poll suggests nearly half of the American public believes the administration moves are due to ties to the energy industry. Bush and Vice President Cheney were both oil industry executives (although Bush' business partner has admitted theirs was little more than a "dry hole business" providing tax shelter for investors). China Policy: Belligerence or Inexperience? Following President Bush's unprecedented public commitment of support for the defense of Taiwan, relations with China appeared headed for further deterioration with the announcement that the administration may allow Taiwanese President Chen Shu-bian to meet with members of congress during stopovers on a trip to Latin America. The granting of a visa to President Lee Teng-hui in 1995 led to the discontinuation of talks on the future of Taiwan, which have not resumed. Read more about China Policy: Belligerence or Inexperience? An EU delegation hurriedly dispatched to Washington after the Bush administration disowned the Kyoto treaty on global warming last week expressed disappointment yesterday that US negotiators ruled out any role in implementing the agreements and offered no alternatives. Kjell Larsson, the Swedish environment minister who led the delegation, said he was happy that the Bush environment team accepted the existence of global warming - a conclusion widely challenged in the US - and that a US delegation would be sent to Bonn in July for talks on climate change. However, the Europeans failed to win an undertaking from Christine Todd Whitman, the head of the US environmental protection agency (EPA), to attend the meeting in person. "She has not committed to that," an EPA spokesman said yesterday.